To win this fantastic prize simply follow the four steps below. Like/Follow our social media pages on Facebook, Twitter, and Instagram. 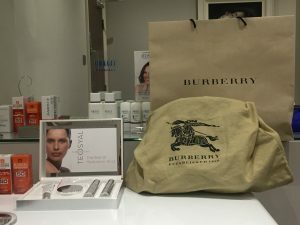 Share the posts showing the Burberry bag. Upload screenshots of you sharing the posts via the form below. Why not treble your chances of winning by sharing our posts on all three social media platforms? *All entries are subject to the competition Terms & Conditions below. One entry per social media platform. Removal of any shared/liked posts is an automatic withdrawal from the competition. No correspondence will be taken into account – judge’s decision is final. Winner’s name to be announced in a public post. Winner will have to pay for courier delivery or collect themselves with photographic ID (passport or driving licence only). Prize is final – it will not be exchanged for cash/credit, or treatments. Closing date will be announced on our social media page.